Hello Dealsnloot Readers,Download App for First Time & Get Rs 50 Cluebucks Free. Hope you all know about Last year when Shopclues Credited Rs 50 Cluebucks for Free But This Time, You have to Download Shopclues App for First Time then Sign up your Shopclues account to receive your Rs 50 Cluebucks. You can purchase anything on Shopclues.com. 1 Cluebucks = Rs 1. So Hurry up and download Shopclues App Now Shopclues Is Back With A New Deal Of Free Cluebucks As They Provided On Last Christmas. Shopclues Mega Diwali Sale Is Going As We All Know From 21 To 28 September.In This Mega Sale You Will Get 50% To 80% Discounts On Big Brands As Well As Lowest Cost Products. Shopclues Also Offering A Good Deal In Which You Will Get ₹ 50 Cluebucks Free If You Downloaded Their App First Time On Your Device. How to Get Free 50 Cluebucks on Shopclues ? 8. 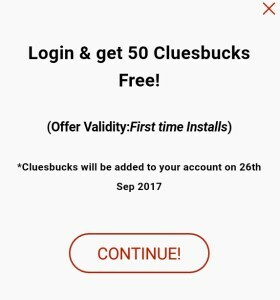 You will get Rs 50 Clue bucks free Credited On 26 Or 27 September. 1. Offer Valid On 1st Time App Install Only. 2. Clubucks Should Be Credited On 26 Or 27 September. 3. 50 Clubucks Value Is = ₹ 50. 4. Cluebucks Can Be Used Only For Shopping On Shopclues App. 5. Offer Valid For Limited Time & Users.